May is the longest and busiest month for many teachers....including me! During May, we generally have yearly observations and evaluations, we celebrate Mother's Day with our students' moms, we finish up assessments, we start planning our end-of-year celebrations while thinking about what changes we'll be doing for next year......and these are just some of the happenings of this month. May is also a month to reflect and celebrate out big milestones achieved and start the transition to the next grade level, in my case, kindergarten. 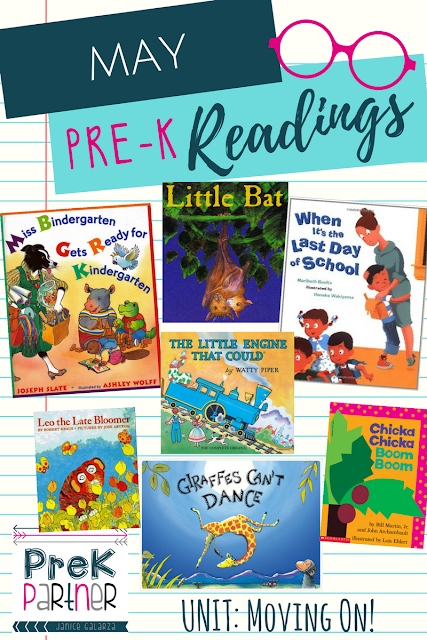 As we prepare to Move On, we truly enjoy these titles for our future kindergarteners. My personal favorite of this month is Leo the Late Bloomer. It begins as Leo not being good at anything, not writing, not reading, not eating properly. As the time progresses, Leo bloomed and was able to draw nicely and neatly, eating properly, and ready for his next life chapter - just like my kiddos. Learn more HERE about how Learning Genie can make your teacher life easier with assessments and incorporating quality literature into your students' daily reports and individualized based on their needs and interests. Practice makes man impeccable so it is open guidance for the players to rehearse much so as to make you shot ideal for the challenge that is really great. You can get online accounting essay which will helpful to the all students. So be prepared and we are wishing absolute best of fortunes to the players.